1 Queen & 2 Twin Beds! Located in the historic eastside of Santa Fe, this 2 bedroom, 2 bath guest casita is in a sought-after location steps away from Canyon Road and a short walk to the historic Plaza. The adobe casita dates back to 1839 and is filled with history. 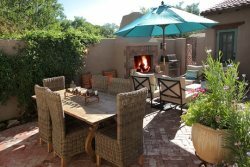 Recently remodeled, the home exudes Santa Fe elegance and charm. The casita is hidden "behind adobe walls" offering the utmost privacy, yet is mere steps to galleries and restaurants, and is right down the street from Downtown Subscription and Garcia Street Books. You enter the casita through two wooden doors and walk into an enchanting courtyard complete with a fountain. There is a full-service kitchen with updated appliances and an outdoor grill. The formal dining and living room are perfect for entertaining and include a kiva fireplace. The cozy TV room has a surround sound bar and DVD player, and all main rooms are equipped with speakers for music. Approximately 1,921 square feet and includes two parking spots. Prime Location: Steps away to Canyon Road; Galleries, Shops and Restaurants. *Master Bedroom is accessed through a private entrance from the courtyard or through the adjoining guest bedroom/bathroom. Your company should be a role model for others. You do a terrific job. Thank you!